An ideal custom jacket for service professionals or construction workers, this canvas jacket is water resistant and features cotton jersey fabric in the body to keep you warm and comfortable on cool weather days. 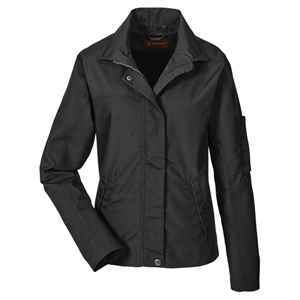 This custom work jacket is made with a 8.26 oz, water-resistant 80% polyester, 20% cotton coated canvas shell and a 65% polyester/35% cotton jersey body with 100% polyester taffeta lining in the sleeves. Ideal for any worksite, this custom jacket features an inner pocket for your valuables, double welt pen pocket on the left arm for convenience and lower front welt pockets with hidden snap closures. Adjustable cuffs with snaps help to keep body warmth inside. Measure around your natural neckline keeping one finger between the tape measure and your neck.